International Desk: A major fire has engulfed the medieval cathedral of Notre-Dame in Paris, one of France's most famous landmarks. The 850-year-old Gothic building's spire and roof have collapsed but the main structure, including the two bell towers, has been saved, officials say. Firefighters are still working to contain the blaze as teams try to salvage the artwork stored inside. President Emmanuel Macron called it a "terrible tragedy". The cause of the fire is not yet clear. Officials say it could be linked to the renovation work that began after cracks appeared in the stone, sparking fears the structure could become unstable. Paris prosecutor's office said it had opened an inquiry into "accidental destruction by fire". A firefighter was seriously injured while tackling the blaze. Visibly emotional, Mr Macron said the "worst had been avoided" and vowed to launch an international fundraising scheme to rebuild the cathedral. The fire began at around 18:30 (16:30 GMT) and quickly reached the roof of the cathedral, destroying its stained-glass windows and the wooden interior before toppling the spire. Some 500 firefighters worked to prevent one of the bell towers from collapsing. More than four hours later, fire chief Jean-Claude Gallet said the main structure had been "saved and preserved" from total destruction. Sections of the cathedral were under scaffolding as part of the extensive renovations and 16 copper statues had been removed last week. 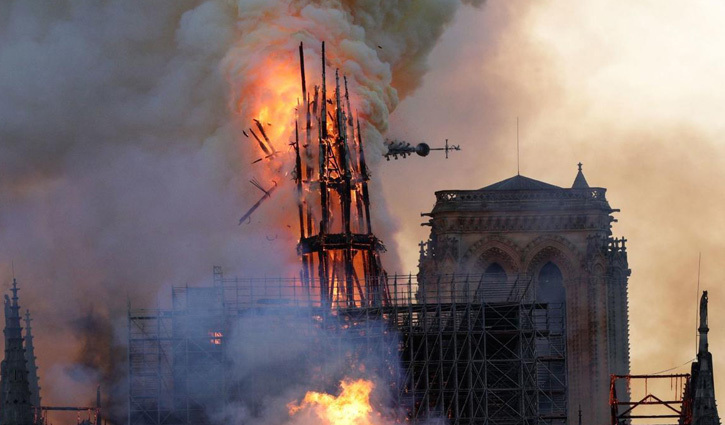 Deputy Paris Mayor Emmanuel Gregoire said the building had suffered "colossal damages", and teams were working to save the cathedral's remaining artwork.